Abstract: Our paper aims to examine several aspects of the epideictic genre according to the tradition of the Brussels School of Rhetoric. We study, at first, the confused notions as a specific material for the rhetorical art, and, in particular, for the epideictic genre as they contribute to create the social concord. 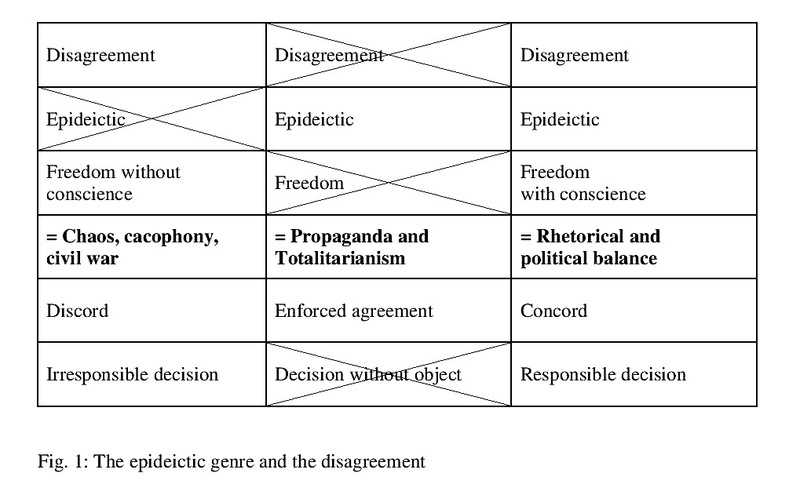 Then, we establish a relationship between disagreement and epideictic genre after the Perelman’s New Rhetoric. Here, our idea is to show how disagreement feeds the argumentative nature of this third rhetorical genre. In a democratic society, the epideictic genre needs to work well to allow disagreement; and likewise, disagreement requires always a well-functioning epideictic. According to Perelman, if the epideictic genre constitutes the foundations of the rhetorical system, or even its “crowning”, it is also the center, the mobile part of this system, in other words: its limbs. Keywords: Chaim Perelman, confused notions, concord, disagreement, epideictic genre, Eugène Dupréel, rationality, rhetoric. Our paper aims to examine several aspects of the epideictic genre according to the tradition of the “Brussels School of Rhetoric” started with Eugène Dupréel and Chaim Perelman. We study how, in the epideictic genre, the “confused notions” contribute to create social concord. 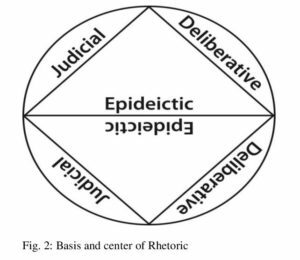 The relationship between disagreement and epideictic genre in Perelman’s New Rhetoric will then be considered to show how disagreement feeds the argumentative nature of this third rhetorical genre. To start with, taking as a frame the perspective of Emmanuelle Danblon, in which rhetoric is a technè and the orator is a craftsman, we would like to show how the “confused notions” (in the sense given by Eugène Dupréel) could be shaped in a specific way, according to the desired rhetorical purpose, to become efficient tools, which will be destined to a “good use” by the orator. Avant d’être classées comme connaissances claires ou confuses, les connaissances servent à quelque chose, à la vie des individus et des sociétés; les mensonges même ont leur utilité, on ne les produirait pas sans cela. La connaissance est donc une valeur d’action. […] Une notion, tout ce que désigne un mot ou une phrase, cela n’est pas élaboré par un souci de correspondance avec un objet réel, c’est un instrument dont on se sert et dont la valeur se mesure d’abord à son rendement. (Dupréel, 1949, p. 332). Before being classified as clear or confused knowledge, knowledge is used to something, in the lives of persons and societies; lies even have their uses, they will not happen without it. Knowledge is therefore an acting value. […]. A notion, everything that refers to a word or phrase, is not developed by a desire to match with a real object; it is a tool that is used and its value is measured primarily to performance[i]. Ne travaillant pas, comme le savant, entre une intention précisée et un mode de vérification fixé d’avance, ne déterminant qu’en cours de route son intention, le philosophe verra toujours son œuvre moins formellement accomplie et non formellement vérifiée: en fait il ne peut compter que sur l’adhésion gagnée, sur l’accord avec lui-même et l’accord avec les autres esprits, ce qui n’est jamais un critère, mais un état de chose, difficile et précaire. […] Au contraire, la valeur d’une vérité philosophique aura bien plus besoin, pour s’imposer, de l’unanimité dans l’adhésion car, en dehors de la conviction de celui qui la découvre, cette approbation d’autrui est en fait son seul appui; or, c’est justement cette adhésion qui se montre plus précaire et moins probable. (Dupréel, 1939, pp. 289-290). Not working, as the scientist, between a specified purpose and a verification mode fixed beforehand, determining only on the way his intention, the philosopher will always see his work less formally completed and not formally checked: actually he can only rely on membership earned, on agreement with himself and the agreement with the other spirits, which is never a criterion, but a state of things, difficult and precarious. […] On the contrary, the value of a philosophical truth will much more need to impose unanimity in membership because, apart from the conviction of the person who discovers it, the approval of others is in fact his only support; however, it is this membership that is more precarious and less likely. To be able to adjust the scope of the notion to a context of use, one needs to require to the reasonable, which Dupréel called “excellence confuse” (Dupréel, 1949, p. 294). Human being is able to make choices without dogmatism, because a way exists to review these choices (Dupréel, 1949, p. 295). For instance, a part of Dupréel’s Traité de morale touches on the values of justice and honor as confused notions. According to him, confusion is a fact that allows to act in a living and human world. Dupréel speaks about a tool, and not about a material. Moreover, he devotes very little attention to which technè has to be optionally used to transform these confused notions into a tool. His students, Chaim Perelman and Lucie Olbrechts-Tyteca, make this point in their article “Les notions et l’argumentation”. Returning on what are exactly confused notions, they explain that argumentation involves playing on its plasticity, through two technaï: either opposing two notions through flexibility on the one hand and curing on the other hand, or extending the semantical core of a single notion. Cette technique qui consiste à figer le concept de l’adversaire tout en donnant plus de souplesse à celui qu’on défend, est généralement adoptée lorsque l’appréciation sur le concept doit résulter, en partie au moins, de l’argumentation. Par contre, dans le cas où la valeur de la notion est nettement établie et préalable à l’argumentation, c’est une autre technique portant plutôt sur l’extension de la notion, qui est généralement employée. (Perelman & Olbrechts-Tyteca, 1989 , p. 136). This technique consisting in freezing the concept of the adversary while providing more flexibility to one we defend, is generally used when appreciating that the concept must result, partially at least, from the argumentation. Contrariwise, if the value of the notion is clearly established prior to the argument, this is another technique involving the extension of the concept, which is generally used. The common values, celebrated in the epideictic genre, are included in this last kind of notions. Public discourses celebrate those values to preserve social concord – homonoia for the Greeks. They are destined to introduce a proairesis, a disposition to act in a good way. In this case, notions are amplified to the maximum in order to appear, as blatant as the sensitive evidence (Danblon, 2002, 130-134). On the other hand, regarding the deliberative genre, decisions have to be taken for the good functioning of the city; regarding the forensic genre, decisions concern the establishment and qualification of past events. Both decisions are bouleutics and derive from public debates. The purpose of the technè is either to make a choice between two notions, or to narrow the semantical core of a notion, questioning respectively what is useful or what is just in a specific case. Places where confused notions can be found might be compared to a kind of “marketplace”, in which the orator can somehow shop around; this metaphor was previously used by Wilhelmus De Pater, talking of Aristotle’s Topics (De Pater, 1965)[ii]. These stores could take the form of the law to be interpreted or great universal declarations like, e.g., Human Rights. Indeed, those expressions of topoi, as commonly accepted premises, form the starting point of the argumentative reasoning. The confusion of the notion allows, as Perelman said, to an agreement on the formula even if disagreements subsist on the interpretation. In that way, we might say it becomes more a tool for concord than a tool for agreement. In Perelman and Olbrechts-Tyteca’s paper, notions are thus presented as tools for persuasion, but after they have been shaped by the technè in accordance with the rhetorical purposes. One may suggest that the confused notions exist beforehand, in the “marketplace”, as raw materials to be shaped, and finally become a tool. We would like to go further on that process that allows to precise the conception of rhetoric as a craft. D’un point de vue naturaliste, la rhétorique se révèle être l’art de tous les artisanats. Elle n’est pas d’une discipline, elle est de toutes les disciplines. Elle exerce l’homme à utiliser son environnement naturel: celui des sociétés humaines. (Danblon, 2013, p. 84). From a naturalistic point of view, the rhetoric appears to be the art of all crafts. It belongs not to a single discipline, it belongs to all disciplines. It exerts the man to use his natural environment: the human societies. The artisan and his skill exist for the sake of the product, the product for the sake of the need. It could not be otherwise, as long as the product of work was considered only from the point of view of its use value, not its exchange value. As for its use value, the product is defined by its service to the person who uses it. (Vernant, 2006 , pp. 295-296). For Danblon, in that framework, the rationality of the craft is directly linked to its efficiency. And so it goes in the rhetorical art, whose worth emerges only if its efficiency is sufficient to impact on man’s action and on the running of the City. As far as the rhetorical activity is concerned, the purpose is to take decisions, and, in Aristotle’s conception, decisions that lead to Happiness in the City. In the classical Greek society of the 5th century, where the first theories of that discipline emerged, the place given to the craftsman has moved. It became associated to menial tasks, whereas the craftsman, before, had occupied a much more prestigious and prevalent position. At the same time, Sophists were leading the first technical reflections about rhetorical technè. That technè was quite different of the craftsman’s technè: while the craftsman implements a poïésis (he creates an artefact out of himself), the orator commits a praxis (he acts on the world) (Vernant, 2006 , p. 291). However, as Danblon has noticed, the category of “using value” is very relevant to us. Furthermore, it could directly be linked to Dupréel’s acting value. The technè aims, in effect, to produce an eidos, such as health or a house, in a certain matter. Such a production presupposes the exercise of a dunamis for which the technè, in a sense, provides the method of use. (Vernant, 2006 , p. 289). To maintain the parallel with rhetoric, confused notions as materials could be shaped according to the context and the purpose, since technè, as we said, depends on the type of decision to be generated. The orator draws on his store, the topical heritage which we mentioned previously, where he could find raw materials. If the orator is a craftsman, that store contains the eidè with which he needs to practice his art. But that conception of eidos might directly lead to a Platonic vision, and seems hardly compatible with the efficiency sought by the Sophists or with Dupréel’s acting value. However, if the eidos is linked to a using value, and that shaping confused notions allows creating new eidè, this hurdle is avoided. Indeed, the orator’s marketplace is only composed of shaped material that could be shaped again, according to the uses encountered or to be encountered, whose meaning will never be defined once and for all. Actually, in the rhetorical art, there is not any raw material: topical heritage is linked to a specific period and is constituted by uses; always moving, and liable to be modified by critics. The dynamic aspect of the notions prevents them from being treated as Platonic ideas. This point of the “using value” leads to another question: the good use of confused notions, in particular in the epideictic genre. Values, confused notions by excellence, keep a privileged relationship with this genre. Perelman has noted that confused notions without critique leads directly to propaganda; so it is necessary to implement them in a whole rhetorical system. From their early works, and contrary to popular belief even in our scientific field, Perelman and Olbrechts-Tyteca give a prominent and leading position to the epideictic genre. There is something very intuitive in their minds. For them, the epideictic is the first of the three genres: even before the deliberative and the judicial. However, Perelman and Olbrechts-Tyteca do not ignore the specific gaps of the epideictic genre in comparison to the two other genres. These gaps give the epideictic a special and marginal nature. In the epideictic genre, there is no opponent, no controversial issue, no debate, and no decision-making. As a genre of circumstance, the epideictic seems secondary, even unimportant in the rhetorical perspective. In a certain sense: a soft and “feminine” genre (against the two others, which are considered more “virile”). We think usually that the epideictic orator speaks in order to say nothing because the subject of the discourse is not controversial; everything in the speech has already been deliberated on. Perelman and Olbrechts-Tyteca oppose this opinion. There is a real ambiguity because they appear to make a marginal (and not “serious”) genre a primary one. What’s more, they denounce the misunderstanding of epideictic. They propose to rediscover its rhetorical and argumentative nature: its place in the field of argumentation. C’est cette incompréhension du rôle et de la nature du discours épidictique – qui, ne l’oublions pas, existait bel et bien, et s’imposait donc à l’attention – qui a encouragé le développement des considérations littéraires en rhétorique et a favorisé, entre autres causes, l’écartèlement de celle-ci entre deux tendances, l’une philosophique […], l’autre littéraire. (Perelman & Olbrechts-Tyteca, 1952 , pp. 15-16). It’s this misunderstanding of the role and the nature of epideictic discourse – which, let us not forget, existed and therefore was well known – which encouraged the development of literary considerations in rhetoric, and encouraged, with other implications, the breakup of rhetoric into two tendencies: one philosophical […] and the other, literary. For Perelman and Olbrechts-Tyteca rhetoric has to be understood as something coherent and efficient. This requires above all, an understanding of the epideictic genre as a place of “communion” and as a mood of gathering. We could suppose that Perelman came to discover rhetoric (and therefore epideictic) through his reflections on legal agreement between two sides as well as the conditions necessary to find this agreement. However, this would be an incorrect interpretation. Upon closer examination, we find that Perelman is not interested, first of all, by agreement, but by disagreement. He is especially interested in how disagreement can give rise to argumentative invention and rhetorical opportunities. For him, disagreement is not a drama, the sign of an error, or the evidence of our irrationality. He is radically opposed to Descartes and all the radical positivists. Perelman argues that there may be two (or x) contrary positions on the same subject without any of these having to be necessarily irrational. Argumentative rationality can also be found in the exploration of disagreement between the parties. For Chaim Perelman, it would be misleading to identify agreement with good choice and/or rationality. L’inspiration fondamentale pour l’élaboration de la théorie de l’argumentation ne me vient pas du droit mais de la philosophie [la question étant] d’où vient le désaccord entre les philosophies. Ce n’est qu’à partir de 1953 que j’ai commencé à m’intéresser sérieusement au raisonnement juridique. (Perelman, 1982). The fundamental inspiration for in the elaboration of a theory of argumentation does not come to me from law but from philosophy; [the question, for me, to find] where the disagreement between the two philosophies has its source. It is only from 1953 onwards that I became interested in legal reasoning. To recapitulate, Chaim Perelman encountered rhetoric and epideictic through the lens of disagreement. However, one of his first texts on rhetoric, “Logique et rhétorique” (published in 1950, and co-authored with Lucie Olbrechts-Tyteca), provides a clear focus on epideictic to rehabilitate it. Interested in the concept and practice of disagreement, Perelman focuses on the genre, which seems most radically distinct from disagreement and which is the least clearly argumentative of the three genres. There is something contradictory here. That is why we need to assume a political and rhetorical link between disagreement and epideictic. A link that Perelman did not explain, but which is implied in his work; a crucial link for understanding what rhetoric really is. That is to say, to see rhetoric as a truly “human work” that can lead the way for a “sense of responsibility and freedom” (Perelman & Olbrechts-Tyteca, 1952 , pp. 42-43). 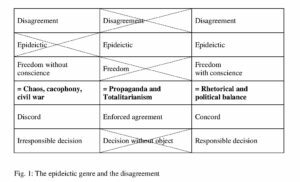 The Perelmanian idea, because it is humanistic aims to express the connection between disagreement and the epideictic genre; to challenge the apparent dichotomy between the two. In a democratic society, epideictic needs to work well to allow disagreement; and likewise, disagreement requires always a well-functioning epideictic. This idea is represented in the table below (see fig. 1). To be clear: we need to ask ourselves, what would disagreement without epideictic? It would be, no doubt, a permanent cacophony; civil conflict, and maybe even chaos. This is why, it is always necessary to regularly nourish the intensity of adherence to certain values to ensure the communion around these values. In the same way, what would epideictic genre be, without disagreement? It would certainly be a dictatorship of enforced agreement and all forms of propaganda and authoritarianism. It is for this reason that rhetorical argumentation only has sense if one places value on adherence. At the same time, this adherence, by nature conditional (i.e. it is a fact, not a right), must exclude the use of violence or coercion. Rhetorical and political balance hangs on this relationship. Ne voyant pas nettement de but au discours épidictique, les anciens étaient donc enclins à le considérer uniquement comme une sorte de spectacle, visant au plaisir des spectateurs et à la gloire de l’orateur, par la mise en valeur des subtilités de sa technique. Celle-ci devient donc un but en soi. Aristote lui-même [la critique est peu charitable, mais passons] ne semble saisir que l’aspect agrément, apparat, du discours épidictique. Il ne perçoit pas que les prémisses sur lesquelles s’appuient les discours délibératifs et judiciaires, dont l’objet lui paraît si important, sont des jugements de valeur. Or ces prémisses, il faut que le discours épidictique les soutienne, les confirme. (Perelman & Olbrechts-Tyteca, 1952 , p 14). Not seeing a clear objective for epideictic discourse, the ancients were thus inclined to consider it only as a sort of spectacle, which pleased spectators and gave glory to the orator, through the showcasing of the orator’s subtle techniques. In this way it thus became a goal in and of itself. Aristotle himself [in an unkind critique, but let’s leave this aside] appears to understand only its pleasing aspect, its pomp and circumstance. He does not understand that the premises on which deliberative and judiciary discourses base themselves, and whose function he values so much, are in fact value judgments. However, these premises must be sustained and confirmed by epideictic discourse. Without epideictic discourse to support or confirm certain values, which are seen as important for a certain community, speakers would be unable of making value judgments. Speakers would be deprived of the capacity to argue. In fact, the formulation of judgments in the deliberative or judicial arena implies always the availability of values for judgment, principles to criticize, and commonplaces to denounce. Without epideictic discourse, without roots, without premises at our disposal, no one could ever formulate anything but senseless and valueless discourses. Cette communion ne détermine pas un choix immédiat, détermine toutefois des choix virtuels. Le combat que livre l’orateur épidictique est un combat contre des objections futures; c’est un effort pour maintenir la place de certains jugements de valeur dans la hiérarchie ou éventuellement leur conférer un statut supérieur. […] Aussi le genre épidictique est-il central dans la rhétorique. (Perelman & Olbrechts-Tyteca, 1952 , p 14). This communion while it does not determine an immediate choice, it does however determine virtual choices. The struggle which the epideictic orator leads, is a struggle against future objections; it is an effort to maintain the place of certain value judgments in the hierarchy, or maybe to give them a superior status. 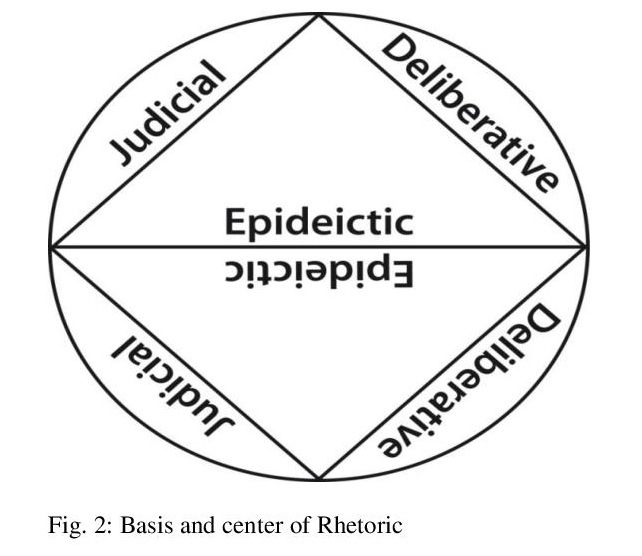 […] In this way, the epideictic genre is central in rhetoric. This genre ensures the stability and the circulation of values. It articulates the continuity and coherence between the past, present and future of the community. In this regard, Perelman goes further than Aristotle. On the one hand, he makes epideictic discourse a place of dialogue between this three temporalities; on the other hand, he makes of it a place, which, in this dialogue, opens the way for a struggle to come, based on these same values. This struggle cannot always take place here and now, because it is neither the time nor the place. This is implied in the rules of the genre. Hence, the deliberative and judicial genres exist to offer an arena for this struggle to take place in the future. From now on, we can say that the epideictic genre cannot be placed outside the field of argumentation. Adherence now and elsewhere is not pre-established. It would be an illusion to believe that the conditions for a communion of conscience could be inscribed in the nature of things. At the same time, if the struggle is delayed for now, it is to allow epideictic discourses to protect the community against itself, against all the threats of discord, fear, and disenchantment. This is why the epideictic genre, is in no case a collection of empty commonplaces or trivialities beyond discussion. In a bold way, and to conclude, we could say that Perelman underlines the precarious character of values and adherence to these, which is present in the epideictic genre. He invites us to recognize this fragility as an opportunity and not as a drama. The act of speaking to reinforce the established order does not seek to deny the existence of problems. Neither is it a question of denying the fragility of the values that are being defended. On the contrary, the aim is to manifest the fact that there is a problem and that the values being defended are indeed fragile ones. Concretely, if there would be no problem, and if values would not be fragile, or confused, there would simply be no need to speak up to set the problem in context. i. Unless otherwise specified, the translations are done by the authors of the paper. ii. We would like to thank Emmanuelle Danblon and Victor Ferry for this reference. Aristotle (1967 ). Rhétorique (vol. 1, trans. by M. Dufour). Paris: Les Belles Lettres. Danblon, E. (2002). Rhétorique et rationalité: Essai sur l’émergence de la critique et de la persuasion. Bruxelles: Éd. de l’Université de Bruxelles. Danblon, E. (2013). L’homme rhétorique: Culture, raison, action. Paris: Éditions du Cerf. De Pater, W.A. (1965). Les topiques d’Aristote et la dialectique platonicienne: Méthodologie de la définition. Fribourg: Ed. St. Paul. Dominicy, M. (2006). Perelman und die Brüsseler Schule. In J. Kopperschmidt & E. Eggs (Eds. ), Die neue rhetorik: Studien zu Chaim Perelman (pp. 73-134). Munich: W. Fink Verlag. Dupréel, E. (1939). Esquisse d’une philosophie des valeurs. Paris: Librairie Félix Alcan. Dupréel, E. (1949). Essais pluralistes. Paris: PUF. Mayeur, I. (2015). Les notions confuses comme matière de l’activité rhétorique: postérité d’un héritage dupréelien. In L. Nicolas (Ed. ), Le fragile et le flou: Apprivoiser la précarité, un art rhétorique, forthcoming. Nicolas, L. (2009). La fonction héroïque: parole épidictique et enjeux de qualification. Rhetorica: A journal of the History of Rhetoric, XXVII, 2, 115-141. Perelman, Ch. & Olbrechts-Tyteca, L. (1952). Rhétorique et philosophie: Pour une théorie de l’argumentation en philosophie. Bruxelles: Presses universitaires de Bruxelles. Perelman, Ch. & Olbrechts-Tyteca, L. (1989 ). Les notions et l’argumentation. In Rhétoriques (pp. 123-150). Bruxelles: Presses universitaires de Bruxelles. Perelman, Ch. & Olbrechts-Tyteca, L. (1969 ). The new rhetoric: A treatise on argumentation (trans. by J. Wilkinson and P. Weaver). Notre Dame: University of Notre Dame Press. Perelman, Ch. (1978). L’usage et l’abus des notions confuses. Logique et Analyse, 81, 3-17. Perelman, Ch. (1979). L’originalité de la pensée d’Eugène Dupréel (à l’occasion du centenaire de sa naissance). Bulletin de la classe des Lettres et des Sciences morales et politiques, LXV, 60-71. Perelman, Ch. (1982). Letter to Marcel Côté (January 4, 1982). Archives and Libraries of the ULB – Fonds Chaim Perelman: BE.ULB – A&B – ARCH.089PP (box 21). Vernant, J.-P. (2006 ). Myth and thought among the Greeks (trans. by J. Lloyd & J. Fort). New York: Zone Books.